In our last issue of International Therapist, our regular case study feature came from Nicolle Mitchell, who discussed her treatment of a client living with dementia. We documented her treatment plan and approach, as well as the client’s history. This gentleman, is a lover of jazz & musician. He is usually very vocal & often does not know when he is being vocal which I interpret as frustration, distress and having unmet needs. He cannot walk or see. Within minutes he had quietened and started to pick out rhythms with his fingers. I quietly watched & delighted in his joy & engagement. We’ve also looked at other benefits music can confer. In our latest issue of International Therapist, we hear from Dr Stella Compton Dickinson about ways that music can improve wellbeing. You can read Nicolle’s original case study here. Her update on Facebook is here. And our latest article, on the benefits of music, is here. We also love hearing from our members about their work. If you have a similar case study you’d like to submit, contact our deputy editor, Dan Ralls, at dralls@fht.org.uk. Want to receive our magazine right to your front door? Join us today to keep up to date on the latest in therapy news and trends. Helen is 53-years old. She lives in West Sussex with her husband, Steve, and three cats. A solicitor by day, Helen’s passion outside of work is belly dancing. She also enjoys walking and gardening in her spare time. Q. When did you first discover complementary therapies? Q. How often do you have complementary therapies? Q. What else do you particularly like about the treatments you have with Alison? ‘The holistic aspect of the therapies is very important. There have been times when I have been under a lot of stress, or my health has been poor – both mentally and physically – and Ali has been able to adjust the treatment to help provide me with the support I need. ‘I find the treatments are a much less aggressive way of dealing with problems. They are supportive and don’t have the same side-effects as drugs or other physical treatments. In addition, any problem I have is not treated in isolation to other aspects of my life and health, so the treatments provide broader support to my overall health and well-being. Q. What are the qualities about Alison that make her a good therapist? ‘Ali is such a warm, caring and approachable person, and easy to talk to. She is perceptive and creative in the way she approaches her treatments, but at the same time, highly professional. 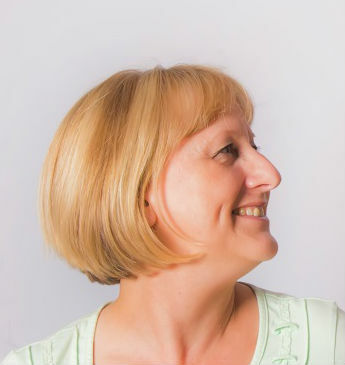 Mary is the author of several books on massage and runs FHT accredited CPD courses. She is co-founder (with Sandra Hooper) of a therapeutic intervention for children called Story Massage. This combines the creativity of storytelling with the benefits of positive and respectful touch. Story Massage has been used successfully with many children in the UK and abroad, including those experiencing trauma in the aftermath of the tsunami in Japan, and the recent earthquake in Nepal. This case study focuses on the use of Story Massage in Westfield School in Leominster, near Hereford. It is a maintained Special School for 50 pupils with severe or complex learning difficulties within the age range 4 to 19 years. 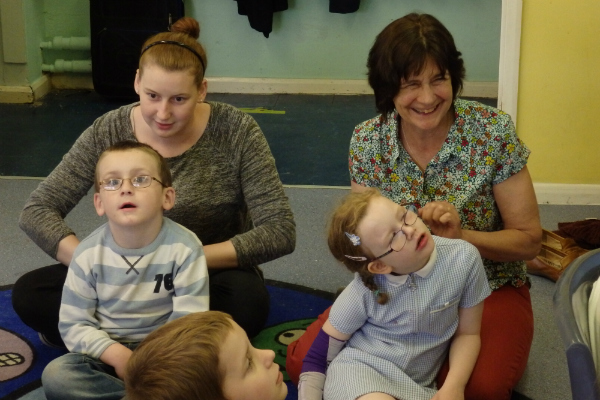 Mary and Sandra worked with Nicky Morris, a teacher in Hedgehog Class (4 to 8 Years), with children experiencing physical, social and learning difficulties. This case study focuses on those children with specific learning difficulties facing individual problems including lack of engagement, low self-esteem, verbal dyspraxia, disturbed sleep patterns and tactile defensive behaviour around unexpected touch. Story Massage is given through clothes, and no oils are used. 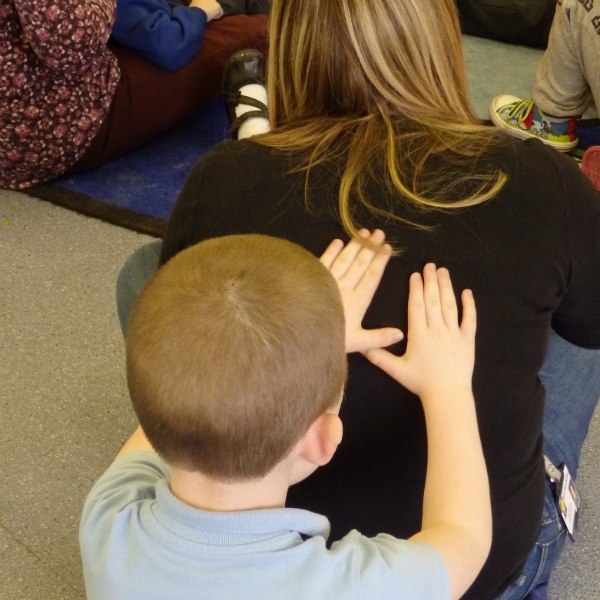 In many schools or organisations, this is a child-on-child activity but at Westfield School, the teachers and teaching assistants have parental permission to use Story Massage with the children. The pupils at Westfield have a wide range of complex needs and we have found that Story Massage brings benefits for all pupils. Story massage is very effective and very easy to put in place across a school. The main benefits at Westfield Special School have been increased levels of engagement; understanding and acceptance of appropriate touch; peer working across phases; and enhancement of the literacy curriculum. With the consent of parents, 5-10 minute Story Massage sessions were introduced into the school day for the 12 children in Hedgehog Class. Massage stories were created using the ten simple massage strokes to accompany familiar stories such as Jack and the Beanstalk and The Little Red Hen. These were presented on a PowerPoint presentation with colourful pictures. Story Massage strokes were adapted for use on different areas of the body that are safe and appropriate for each individual. Children were invited to engage in the activity in whichever way was most meaningful for them on that particular day. Some enjoyed giving and receiving the strokes, whilst others preferred to sit and watch the pictures, say the words out loud or make actions in the air. After a week of regular Story Massage sessions, the children were engaging more fully in the activity. Parents were invited in to the school to find out more about Story Massage and they were keen to be involved as they could see the potential benefits for their children. A new massage story was introduced every two weeks and parents were given copies to use at home. After a month of daily Story Massage sessions in the classroom and at home, the children were showing noticeable improvements that have continued and developed over the academic year. One of the most significant changes has been a sense of calm in the classroom after a session, with children feeling more relaxed and able to concentrate. Story Massage is now a popular part of the school day with pupils choosing their favourite massage stories and engaging in the activity according to their ability. It is now used in all the classes in the school, bringing individual benefits for learners ranging in age from 4 to 19. A boy can now sleep at night if he has a Story Massage at bedtime. A girl has autism and fleeting attention in all situations. Story Massage has helped her concentration and engagement with story books. A boy with verbal dyspraxia and has gradually started to read the story at the same time as the massage takes place. This has boosted his confidence and self-esteem. For several children the combination of words and touch has helped them to remember a sequence of events, actions or words. Story Massage can help autistic children understand and accept appropriate touch. Linda Orrett is listed on the FHT’s Accredited Register of Complementary Therapists, offering massage and hypnotherapy, amongst others. She is a senior therapist with the CALM Team at a major cancer centre in the North West, offering a variety of rapid complementary therapy interventions to distressed patients undergoing medical procedures. This case study focuses on the use of hypnotherapy and relaxation techniques to help an anxious patient with cancer complete a course of radiotherapy. A female patient (who we shall call Jo), had Korsakoff ’s syndrome – a brain disorder usually associated with heavy alcohol consumption over a long period, which causes loss of short-term memory. Jo had a cancer of the tonsils and was in need of radiotherapy. Radiotherapy to the head and neck area involves wearing a mask which is clipped down to the treatment couch to keep the patient absolutely still whilst having the radiotherapy. Some patients find this procedure very challenging and need support whilst having treatment. Jo was flagged up to the CALM Team by the radiotherapists as requiring support. Jo was supported by her daughter and two complementary therapists, including Linda, during the mask making. The process was explained to Jo and she agreed to proceed, but when the mask hardened and tightened she panicked and became overwhelmed and described the mask as ‘closing in on her’, so the procedure was stopped immediately. Jo explained that she tells herself that she’ll ‘be alright’, but she gets frightened and can’t control her anxiety. She agreed that she would try again with the use of oral lorazopam (a mild sedative). Jo returned a few days later and was again supported by Linda and another CALM therapist, as well as her daughter and son. She said that she didn’t remember coming for the procedure previously but she was frightened and visibly upset. Whilst talking to her she disclosed that she had five children and gave the therapists the names of all five children. To help Jo, it was suggested that she focus on something she could easily remember and associate with feeling good and pleasant thoughts – the names of her children and the love she has for them. Jo understood the procedure/ treatment could be stopped at any time. The approach was based on the therapists adapting their training in hypnotherapy and relaxation techniques to the Dementia Friends training delivered to staff in the hospital. Jo agreed that she would give this a go. During the mask making, the therapists repeated the names of Jo’s children to her throughout, asking her to remember what they were like when they were children. This verbal dialogue was maintained throughout, delivered using language and verbal cues that promote deep relaxation. The mask making process was successfully completed. When Jo progressed to the CT scan, the same techniques were used. Jo successfully completed this procedure, too, and was pleased. Jo then came for her six weeks (30 sessions) of radiotherapy treatment. The therapists again used the hypnotherapy and relaxation techniques throughout, expanding them a little by asking her to imagine looking through a photo album full of photos showing her children as they were growing up, holiday photos, photos of special family events such as weddings, and so on. Jo started to have a routine of going for a cup of tea at the end of treatment and also requesting her favourite music (Bruce Springsteen). Jo completed all six weeks of radiotherapy treatment successfully. She said at one point; ‘I can’t believe I have made it through … I am conquering my fear and happy I have been able to get there with treatment… I am not frightened any more … I feel safe being here’. The services and support of Complementary Therapists is recognised by medical professionals in a major cancer centre in the North West . Complementary therapy interventions, such as hypnotherapy and relaxation techniques, can be used to help anxious clients complete distressing medical procedures. As part of an integrated healthcare team, complementary therapists can help to deliver truly patient-centred care.